Music education provides students with experiences that reach far beyond the music classroom. The standards and skills listed below are taught through music instruction, and educators can use this information to share the many benefits of music education with stakeholders. View the four Artistic Processes. View the eleven Anchor Standards. 11. Relate artistic ideas and works with societal, cultural, and historical context to deepen understanding. While we make the transition to the National Core Arts Standards, the original National Standards of Music are provided below, with grade-level achievement standards for reference. View the original nine National Standards of Music. The International Society for Technology in Education Standards (formerly NETS) are the standards for learning, teaching, and leading in the digital age and are widely recognized and adopted worldwide. 1. Facilitate and inspire student learning and creativity. Teachers use their knowledge of subject matter, teaching and learning, and technology to facilitate experiences that advance student learning, creativity, and innovation in both face-to-face and virtual environments. 2. Design and develop digital age learning experiences and assessments. Teachers design, develop, and evaluate authentic learning experiences and assessment incorporating contemporary tools and resources to maximize content learning in context and to develop the knowledge, skills, and attitudes identified in the NETS. 3. Model digital age work and learning. 4. Promote and model digital citizenship and responsibility. 5. Engage in professional growth and leadership. 3. Research and information fluency. 4. Critical thinking, problem solving, and decisionmaking. 6. Technology operations and concepts. The Partnership for 21st Century Skills is a national organization that advocates for 21st century readiness for every student. As the United States continues to compete in a global economy that demands innovation, P21 and its members provide tools and resources to help the U.S. education system keep up by fusing the 3Rs and 4Cs (Critical thinking and problem solving, Communication, Collaboration, and Creativity and innovation). While leading districts and schools are already doing this, P21 advocates for local, state, and federal policies that support this approach for every school. The Common Core State Standards (CCSS) provide a consistent, clear understanding of what students are expected to learn so that teachers and parents know what they need to do to help them. The standards are designed to be robust and relevant to the real world, reflecting the knowledge and skills that our young people need for success in college and careers. Music educators incorporate the CCSS into their teaching in many ways, and it is essential that we link the benefits of music education to standards. The information below provides a summary of key points and links to the standards most related to music instruction. Key points for English language arts standards. The standards establish a “staircase” of increasing complexity in what students must be able to read so that all students are ready for the demands of college‐ and career‐level reading no later than the end of high school. The standards also require the progressive development of reading comprehension so that students advancing through the grades are able to gain more from whatever they read. Through reading a diverse array of classic and contemporary literature, as well as challenging informational texts in a range of subjects, students are expected to build knowledge, gain insights, explore possibilities, and broaden their perspective. Because the standards are building blocks for successful classrooms but recognize that teachers, school districts, and states need to decide on appropriate curriculum, they intentionally do not offer a reading list. Instead, they offer numerous sample texts to help teachers prepare for the school year and allow parents and students to know what to expect at the beginning of the year. The standards mandate certain critical types of content for all students, including classic myths and stories from around the world, foundational U.S. documents, seminal works of American literature, and the writings of Shakespeare. The standards appropriately defer the many remaining decisions about what and how to teach to states, districts, and schools. The ability to write logical arguments based on substantive claims, sound reasoning, and relevant evidence is a cornerstone of the writing standards, with opinion writing—a basic form of argument—extending down into the earliest grades. Research—both short, focused projects (such as those commonly required in the workplace) and longer term, in-depth research—is emphasized throughout the standards but most prominently in the writing strand, since a written analysis and presentation of findings is so often critical. Annotated samples of student writing accompany the standards and help establish adequate performance levels in writing arguments, informational/explanatory texts, and narratives in the various grades. The standards require that students gain, evaluate, and present increasingly complex information, ideas, and evidence through listening and speaking, as well as through media. An important focus of the speaking and listening standards is academic discussion in one‐on‐one, small‐group, and whole‐class settings. Formal presentations are one important way such talk occurs, but so is the more informal discussion that takes place as students collaborate to answer questions, build understanding, and solve problems. The standards expect that students will grow their vocabularies through a mix of conversations, direct instruction, and reading. The standards will help students determine word meanings, appreciate the nuances of words, and steadily expand their repertoire of words and phrases. The standards help prepare students for real-life experience at college and in 21st century careers. The standards recognize that students must be able to use formal English in their writing and speaking but that they must also be able to make informed, skillful choices among the many ways to express themselves through language. Vocabulary and conventions are treated in their own strand, not because skills in these areas should be handled in isolation, but because their use extends across reading, writing, speaking, and listening. Just as media and technology are integrated in school and life in the 21st century, skills related to media use (both critical analysis and production of media) are integrated throughout the standards. Key points for mathematics standards. The K‐5 standards provide students with a solid foundation in whole numbers, addition, subtraction, multiplication, division, fractions, and decimals—which help young students build the foundation to successfully apply more demanding math concepts and procedures and move into applications. The K‐5 standards build on the best state standards to provide detailed guidance to teachers on how to navigate their way through knotty topics such as fractions, negative numbers, and geometry and do so by maintaining a continuous progression from grade to grade. The standards stress not only procedural skill but also conceptual understanding, to make sure students are learning and absorbing the critical information they need to succeed at higher levels — rather than the current practices by which many students learn enough to get by on the next test but forget it shortly thereafter, only to review again the following year. Having built a strong foundation K‐5, students can do hands-on learning in geometry, algebra, and probability and statistics. Students who have completed 7th grade and mastered the content and skills through the 7th grade will be well prepared for algebra in grade 8. The high school standards call on students to practice applying mathematical ways of thinking to real-world issues and challenges; they prepare students to think and reason mathematically. The high school standards set a rigorous definition of college and career readiness by helping students develop a depth of understanding and the ability to apply mathematics to novel situations, as college students and employees regularly do. The CCSS for Speaking and Listening can apply to group discussions relating to musical instruction. The CCSS for History/Social Studies can apply to music history and the historical context of musical literature. The CCSS for Science and Technical Subjects can apply to the process, structure, and skills involved in project-based learning, especially related to music technology projects. Substitution - Technology acts as a direct tool substitute, with no functional change. Augmentation - Technology acts as a direct tool substitute, with functional improvement. Modification - Technology allows for a significant task redesign. 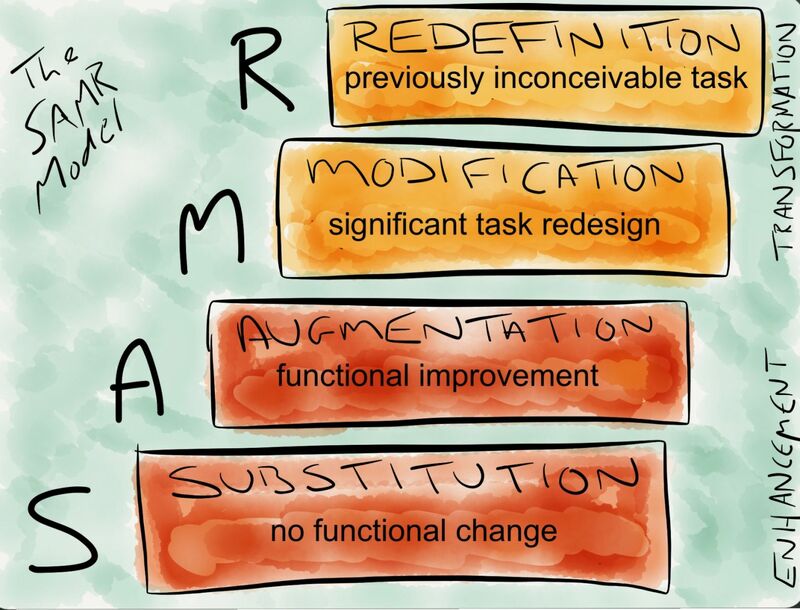 Redefinition - Technology allows for the creation of new tasks, previously inconceivable.